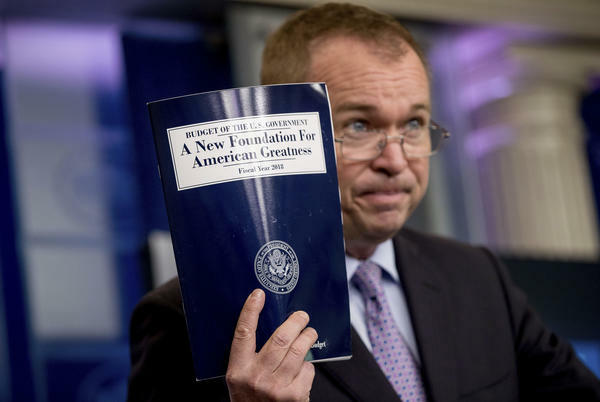 Budget Director Mick Mulvaney holds up a copy of President Trump's proposed fiscal 2018 federal budget at the White House on Tuesday. It restates the goals of the "skinny budget" the administration released in March, which was widely condemned by scientists and public health advocates. Mick Mulvaney, director of the Office of Management and Budget, said Monday that the goal is to cut back on public assistance and instead put people back to work. "We are going to measure compassion and success by the number of people we help get off of those programs and get back in charge of their own lives." No one thinks the president's budget will pass as proposed, since Congress has budget and spending authority. But it does provide a baseline from which negotiations may begin. "The president is right to take a close look at spending," says Sen. Chuck Grassley, R-Iowa. But "Congress has the power of the purse strings. I've never seen a president's budget proposal not revised substantially." Here's a rundown of the budget's medical research and health care proposals. Medicaid: The budget proposes cutting Medicaid and CHIP, the Children's Health Insurance Program, by $616 billion over 10 years, with almost half the savings occurring in the last two years. But it appears that the $616 billion number doesn't include the roughly $800 billion that would be cut from Medicaid funding by the House-passed version of the American Health Care Act. Mulvaney told the House Budget Committee Wednesday that there is some overlap in the two numbers, but the exact amount of the overlap remains a mystery. The joint federal-state programs provide health care and support services for 75 million low-income, elderly and disabled people, about half of whom are children. In 2015, federal and state spending on Medicaid was about $545 billion. The budget mirrors the changes in Medicaid included in the health care overhaul bill passed by the House earlier this month. Rather than the federal government matching state spending based on beneficiaries' health care needs, it would give states a fixed amount of money per enrollee or, alternatively, offer states a fixed block grant. That would cut the program's growth over time and reduce services because health care costs grow faster than the broad economy. Medicaid benefits for the elderly and disabled: Medicaid pays for services — including personal care, shopping or cooking for the elderly, and occupational therapy and work support for the disabled — that allow people to continue to live on their own. Under the law, those services are considered optional. But Medicaid is required to pay for nursing home and institutional care. "We'll see a return to more people with disabilities and more older adults not having access to services that allow them to remain at home," says Barbara Beckert, director of the Milwaukee office of Disability Rights Wisconsin. "Instead, we may see people forced into institutions, forced into nursing homes." Refugee benefits: The proposed budget makes the argument that the U.S. should reduce the number of refugees it brings into this country because those fleeing persecution in their home countries often end up using public assistance, including 50 percent who were on Medicaid in 2015. "The larger the number the United States admits for domestic resettlement, the fewer people the United States is able to help overall," the budget document says. National Institutes of Health: The NIH, which funds research into medical treatments and basic science, would see cuts of almost $6 billion, to about $26 billion. That would include a $575 million cut to the National Heart, Lung and Blood Institute and $838 million cut to the National Institute of Allergy and Infectious Diseases, which is involved in a wide range of diseases including AIDS and Zika. The National Institute of Diabetes and Digestive and Kidney Diseases would be cut by $355 million. The proposed cuts drew immediate and harsh criticism. The cuts would "cripple our nation's scientific efforts, undermining our economic growth, public health and national security," Mary Sue Coleman, president of the Association of American Universities, said in a statement. The cuts could "hobble our ability to provide tomorrow's cures and technologies." Centers for Disease Control and Prevention: The administration proposes trimming the CDC, which helps states and other countries fight infectious disease outbreaks, by $1.3 billion — 17 percent. That could include a $186 million cut in programs at the CDC's center on HIV/AIDS, hepatitis and other sexually transmitted diseases. The CDC's chronic disease prevention programs, such as those for diabetes, heart disease, stroke and obesity, would be cut by $222 million. The proposed cut to CDC "would be perilous for the health of the American people," says John Auerbach, president and CEO of the Trust for America's Health. "From Ebola to Zika to opioid misuse to diabetes to heart disease, the CDC is on the front lines keeping Americans healthy." The budget shows a basic misunderstanding of how these agencies function, says Ryan Hohman, vice president of public affairs at the group Friends of Cancer Research. "To further suggest that private sector industry make up for such a significant cut to the FDA as proposed by the president shows a lack of knowledge for how user fees can be used and the scope of the FDA's pivotal role in assuring the safety of the daily lives of Americans." The budget doesn't explicitly address high drug costs, though Trump has frequently inveighed against drug prices, telling Congress in February that it should "work to bring down the artificially high price of drugs and bring them down immediately." Planned Parenthood: The family-planning organization has been the target of efforts to cut funding for years because it provides about one-third of the nation's abortions. This budget would be the first to bar a specific provider, according to Planned Parenthood. And it would bar the organization not only from Medicaid funding but also from any other Health and Human Services program, including the Title X family planning program, maternal and child health, STD testing and treatment, and Zika prevention. "From Day 1, President Trump has worked to keep his pro-life promises, including stopping taxpayers from being forced to fund abortion and abortion businesses," says Marjorie Dannenfelser, president of the anti-abortion group Susan B. Anthony List. "Taxpayers should not have to prop up Planned Parenthood's failing, abortion-centered business model." Planned Parenthood officials said Tuesday that many of their clients don't have other places to get health care. "We've already seen the results of these sorts of policies in Texas, so we know what would happen," says Kevin Griffis, vice president at Planned Parenthood Federation of America. "The heartbreaking truth is that if this budget were enacted, the results would be catastrophic for countless women and their families — cancers and diseases going undetected, higher maternal mortality and more unintended pregnancies."